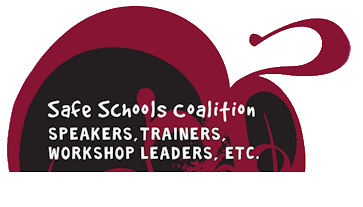 Welcome to the Safe Schools Coalition Speakers Bureau! For over 20 years we have provided trainings that supported the development of safe, inclusive, and welcoming schools and communities for all , including LGBTQ people. Our trainers are experienced in working with a broad range of schools and community groups, including school districts, K-12 schools, youth organizations, faith-based groups, universities, non-profits, schools of education, and much more. We tailor our content to best meet the needs the groups we served. We collaborate with a host of other agencies who also provide relevant training on these topics. For more information please contact our speakers bureau chair Tracy Flynn.